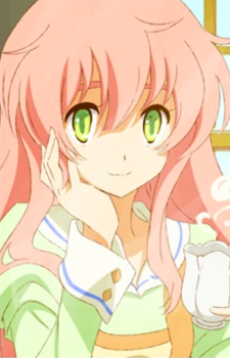 Generally referred to as either "I" (わたし Watashi) or "Ms. Sweets" (お菓子ちゃん Okashi-chan), the main character is a girl with long pink hair who serves as a mediator between human kind and the fairies. She is initially seen with short hair. Due to a FairyCo. hair growth product her hair is alive. Her weapon of choice seems to be knives. Though seemingly a very kind and caring person, Watashi's personality is that of a fox. She is presented as a very cunning and observant character, and prioritizes her well-being over everything else. She also seems to be fond of witty, ironic comments and has shown a rather pessimistic approach to life.